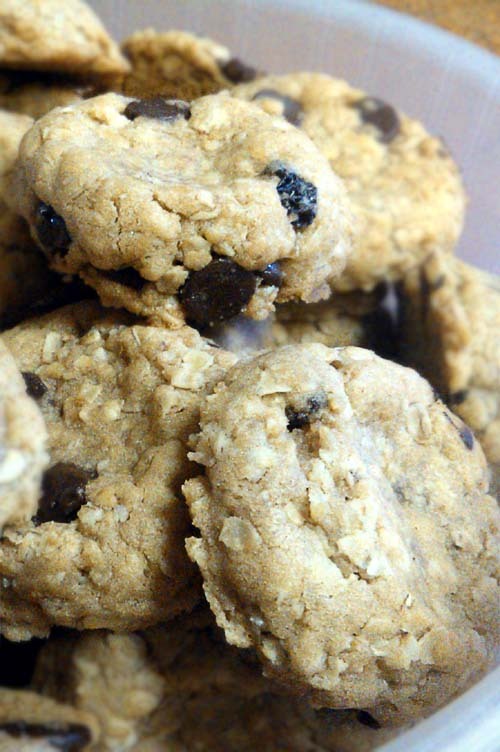 These oatmeal cookies are chewy. You don't have to add chocolate chips and/or raisins. Use walnuts, butterscotch or any other flavor fillers. Great for an afternoon snack with cold milk. The video source of the recipe is included below. In a medium to large bowl, add butter, white sugar, brown sugar, and egg. Mix until fluffy. Best to use an electric handmixer or a stand mixer. In a smaller bowl, combine flour, oatmeal, baking powder and baking soda. Mix well. Gradually stir in flour mix with wet ingredients. Keep mixing until well combined. Add chocolate chips and raisins. Mix. At this point, it is best to stir manually using a wooden spoon so that the chocolate chips don't break up. Using a spoon or an ice cream scoop, arrange balls of cookie dough on baking tray lined with parchment paper. Flatten using the palm of your hands or with the back of a spoon. After removing from oven, cool for, at least, 5-10 minutes before serving.